The New York Stock Exchange previously published end-of-month data for margin debt on the NYX data website, including historical data going back to 1959. Because of NYSE’s suspension of publication, we have turned to FINRA to continue our analysis. The figures differ in their inclusion of firms. For data through January 2010, debit balances were derived by adding NYSE debit balances in margin accounts to FINRA debit balances in customers’ cash and margin accounts and credit balances were derived by adding NYSE free credit balances in cash and margin accounts to FINRA free and other credit balances in customers’ securities accounts. For data after January 2010, “As of February 2010, data are collected pursuant to FINRA Rule 4521 and are aggregated across all member firms, regardless of whether the firm was designated to NASD or the New York Stock Exchange (NYSE) before the consolidation of NASD and the member firm regulation operations of NYSE Regulation in July 2007 that created FINRA,” (FINRA statistics definition, FINRA website). As a result of this change, the debt data is higher than the NYSE data. Let’s examine the numbers and study the relationship between margin debt and the market, using the S&P 500 as the surrogate for the latter. The first chart shows the two series in real terms — adjusted for inflation to today’s dollar using the Consumer Price Index as the deflator. At the 1997 start date, we were well into the Boomer Bull Market that began in 1982 and approaching the start of the Tech Bubble that shaped investor sentiment during the second half of the decade. The astonishing surge in leverage in late 1999 peaked in March 2000, the same month that the S&P 500 hit its all-time daily high, although the highest monthly close for that year was five months later in August. A similar surge began in 2006, peaking in July 2007, three months before the market peak. Debt hit a trough in February 2009, a month before the March market bottom. It then began another major cycle of increases. 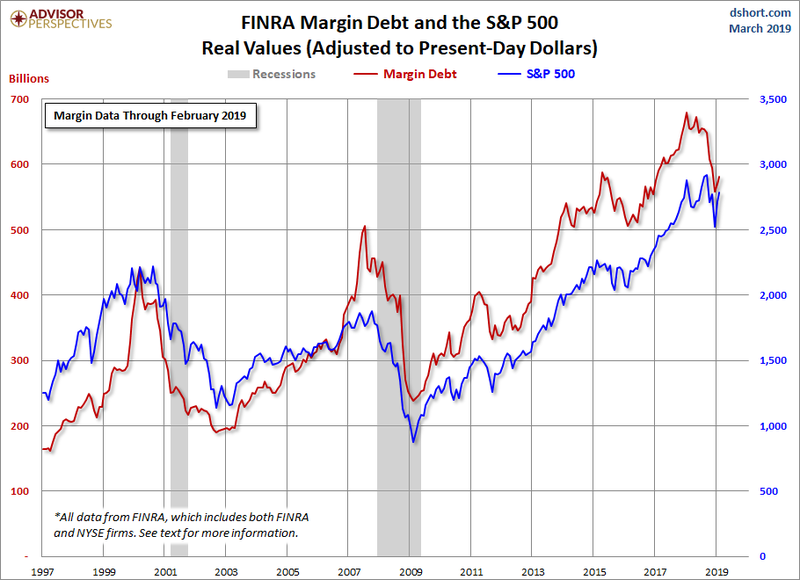 FINRA has released new data for margin debt, now available through February. The latest debt level is up 2.25% month-over-month. The February data gives us an additional sense of recent investor behavior. 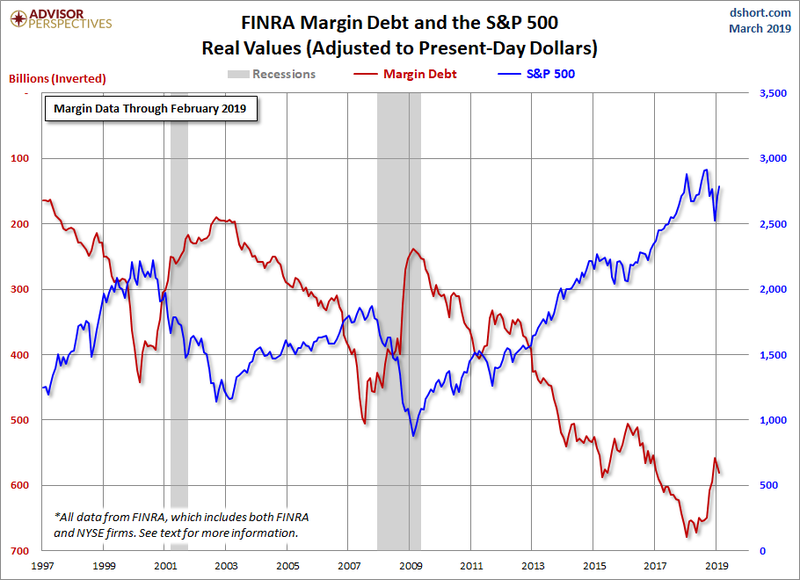 At the suggestion of Mark Schofield, Managing Director at Strategic Value Capital Management, LLC, we’ve created the same chart with margin debt inverted so that we see the relationship between the two as a divergence. The next chart shows the percentage growth of the two data series from the same 1997 starting date, again based on real (inflation-adjusted) data. We’ve added markers to show the precise monthly values and added callouts to show the month. Margin debt grew at a rate comparable to the market from 1997 to late summer of 2000 before soaring into the stratosphere. The two synchronized in their rate of contraction in early 2001. But with recovery after the Tech Crash, margin debt gradually returned to a growth rate closer to its former self in the second half of the 1990s rather than the more restrained real growth of the S&P 500. But by September of 2006, margin again went ballistic. It finally peaked in the summer of 2007, about three months before the market. Lance Roberts of Real Investment Advice analyzes margin debt in the larger context that includes free cash accounts and credit balances in margin accounts. Essentially, he calculates the Credit Balance as the sum of Free Credit Cash Accountsand Credit Balances in Margin Accounts minus Margin Debt. 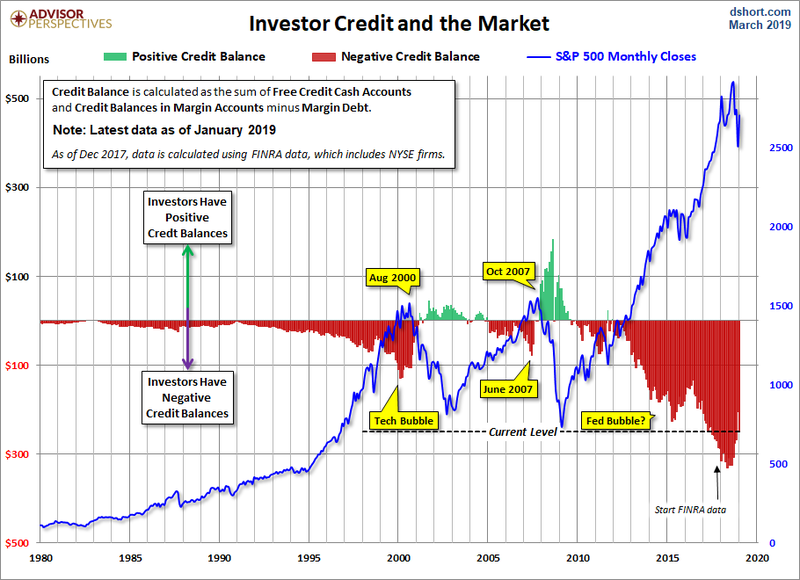 The chart below illustrates the mathematics of Credit Balance with an overlay of the S&P 500. Note that the chart below is based on nominal data, not adjusted for inflation. Here, we have retained the NYSE data through November 2017 and switched to the FINRA data moving forward. Here’s a slightly closer look at the data, starting with 1997. Also, we’ve inverted the investor credit monthly data and used markers to pinpoint key turning points. As we pointed out above, margin debt data is several weeks old when it is published. 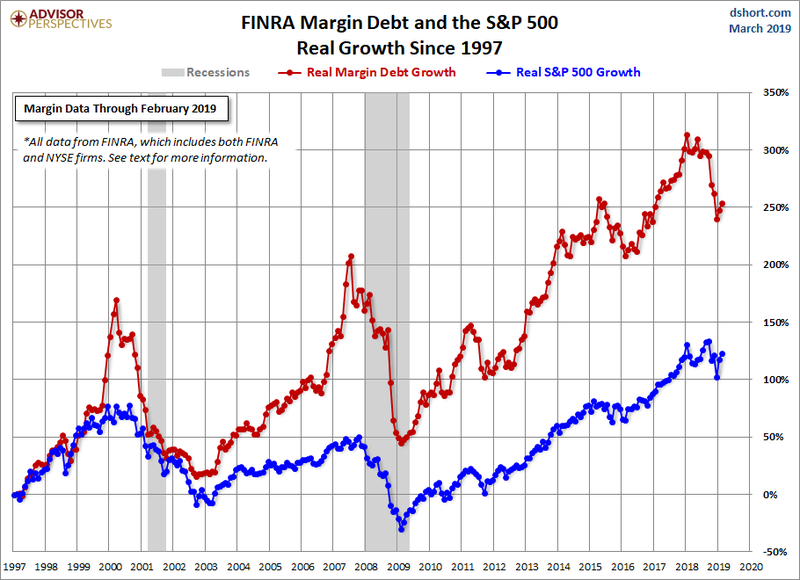 Thus, even though it may, in theory, be a leading indicator, a major shift in margin debt isn’t immediately evident. Nevertheless, we see that the troughs in the monthly net credit balance preceded peaks in the monthly S&P 500 closes by six months in 2000 and four months in 2007. Before the December 24, 2018 correction of 19.78%, the previous S&P 500 correction greater than 15% was the 19.39% selloff in 2011 from April 29th to October 3rd. 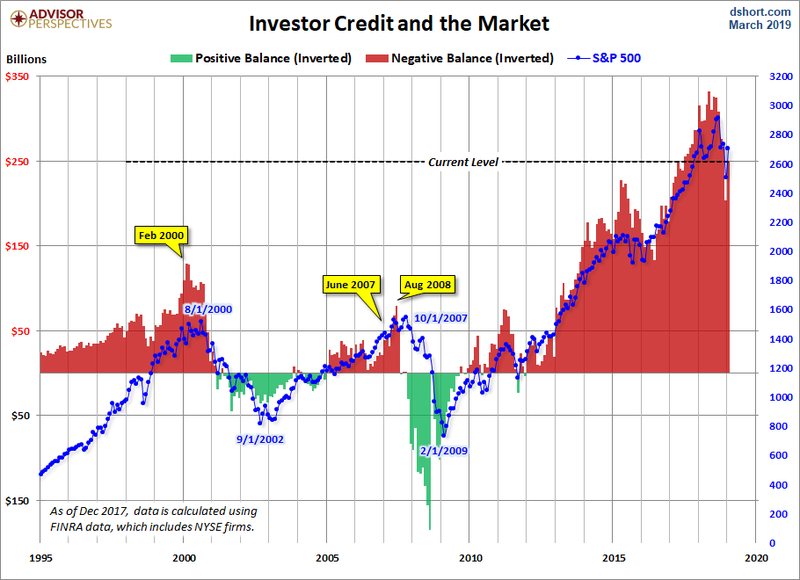 Investor Credit saw a negative extreme in March 2011. There are too few peak/trough episodes in this overlay series to take the latest credit balance data as a leading indicator of a major selloff in U.S. equities. This has been an interesting indicator to watch and will certainly continue to bear close watching in the months ahead. Note on the data: The FINRA only posts the Free Credit Cash Accounts data back to 1997. The Free Credit Cash Accounts data back to 1980 is available on a fee basis from Haver Analytics. Low Interest Rates Might Be What’s Hurting Growth: Cheap credit does a poor job of weeding out zombie companies that compete for scarce resources.